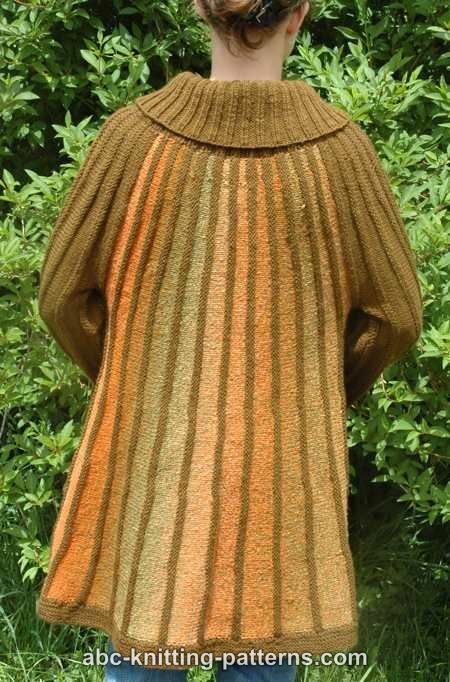 with short repeats the colors stripes will be narrower than in the jacket on the picture. 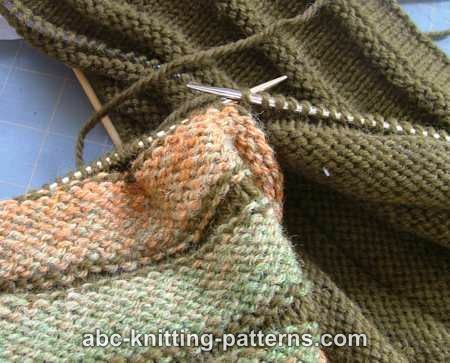 pattern, an extra pair of needles is more convenient. Gauge: 19 sts x 26 rows = 4"x 4" (10 cm x 10 cm) in stockinette st.
Make 1 increase (M1) - I used the increase described by Elizabeth ZimmermanMake a backward loop over the right-hand needle and in the next row purl as a regular stitch. 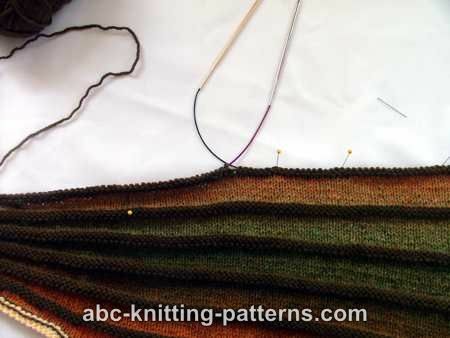 Stitch Patterns: stockinette st, garter stitch, 2x2 ribbing. work left sleeve, back, right sleeve, right half of the front. Short rows are counted as full rows. Cast on 126 (134, 142, 150, 158, 166) sts using provisional cast on method. 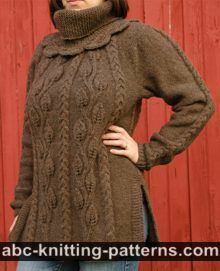 Left Sleeve: Sleeves are worked in color A.
Purl 46 (50, 54, 58, 62, 66) sts which remained on the first pair of needles, turn. Before continuing, block the working piece. 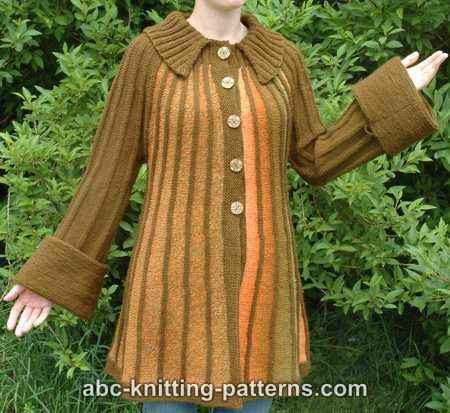 Now is a good time to try on the jacket to make sure that the width of the sleeve is correct. 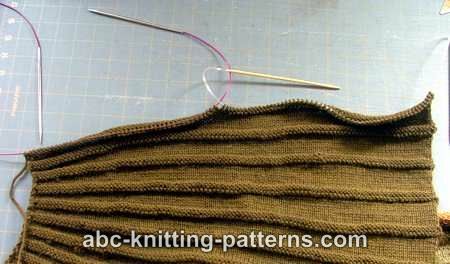 If the sleeve is narrow, work one more repeat. Knit the next row: 46 (50, 54, 58, 62, 66) sts of the sleeve and 80 (84, 88, 92, 96, 100) sts of the front from the second pair of needles. another pair of needles, leaving 46 (50, 54, 58, 62, 66) sts on the old pair. 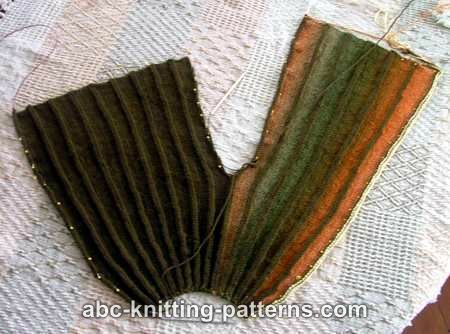 Right Sleeve is worked the same way as Left Sleeve. Before proceeding, block the working piece. With B start the pattern from the 3rd row. Repeat rows 3-20 of the pattern 6 (7, 7, 8, 8, 9) times. 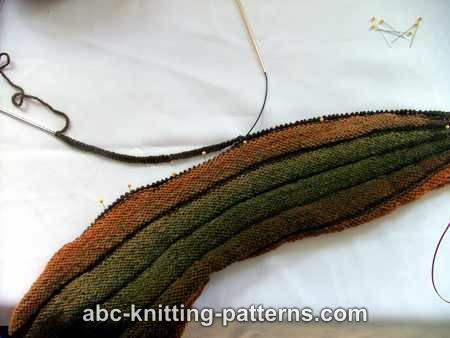 Do not bind off, transfer the stitches to a piece of yarn. (190, 198, 222, 230, 254) sts. For size M repeat rows 2-3 one more time. For size L repeat rows 2-3 two more times. For size XL repeat rows 2-3 three more times. For size 2X repeat rows 2-3 four more times. For size 3X repeat rows 2-3 five more times. Rows 9, 10, 11 as established. Rows 13, 14, 15 as established. with the sts over them. Bind off. off ones. You might wish to leave the stitches open and transfer them to a piece of yarn. hem, join and continue to work in rounds. Bind off. Repeat for the second sleeve. 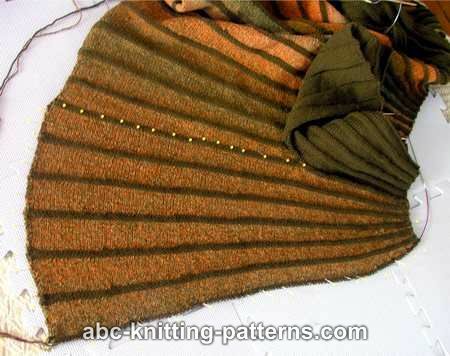 Buttonhole, button and hem bands are worked in garter st as one piece in rows. 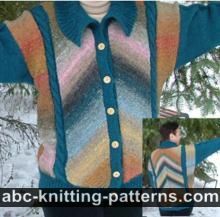 Use 60"
left front, pick up and knit 1 st in the corner and place a marker on the st.
the st.; knit the 126 (134, 142, 150, 158, 166) sts (from the waste yarn) of the right front, pick up and knit sts on the right yoke edge. 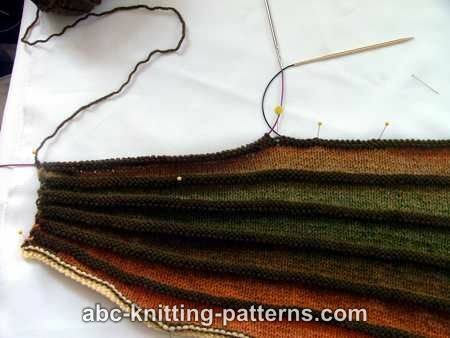 Row 1 (WS): knit all st, except the 2 marked ones, purl the marked sts. calculate how many sts are needed. You have to evenly decrease the excess sts in this row. the corners: m1 before the marked st, k the marked st, m 1 after the marked st.
evenly decrease 8 sts of the right front. 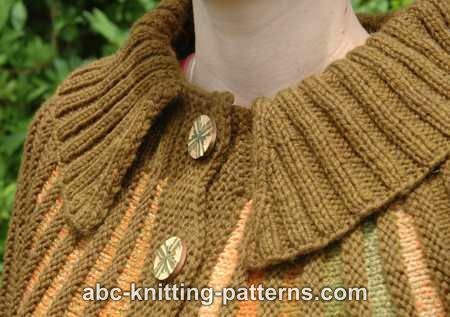 Row 3 (WS): knit, the marked st at the corner - purl. Row 4 as row 2 (no decreases in the front bands) and row 5 as row 3. Row 6 work as row 4 up to the right front: on the right front band make 5 buttonholes. Work 6 more rows, even rows work as row 4, odd rows work as row 3. Bind off. 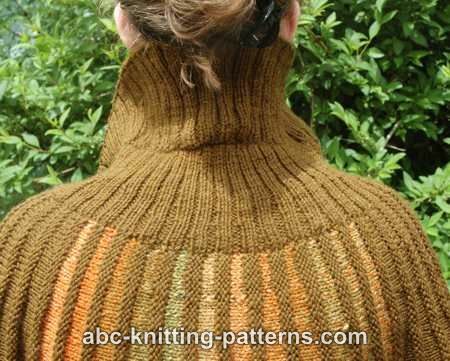 With right side facing, pick up and knit 128 (148, 152, 172, 176, 196) sts along the neckline edge. 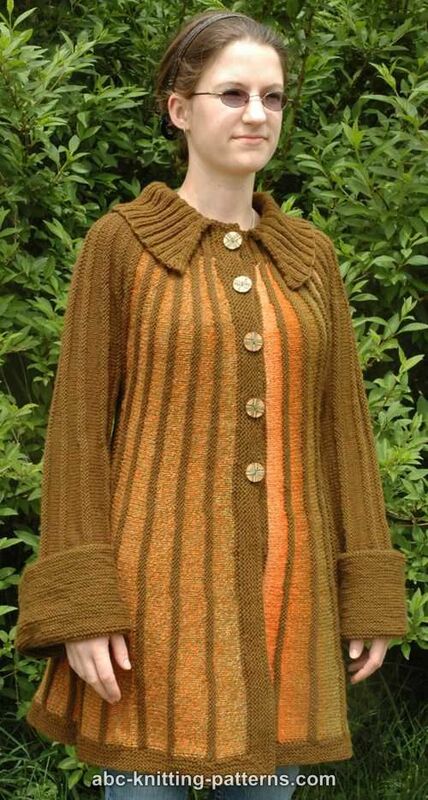 Note: the right side of the collar is the wrong side of the jacket. Row 1 (RS): Sl 1, *k 2, p 2 repeat across to the last 3 sts, k 3. Row 2 (WS): Sl 1, *p 2, k 2 repeat across to the last 3 sts, p 2, k 1.
and before the last 2 sts of the row. 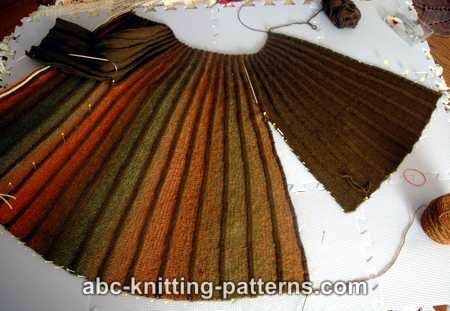 Row 3: evenly increase for 14 sts in the 2-purl groups. 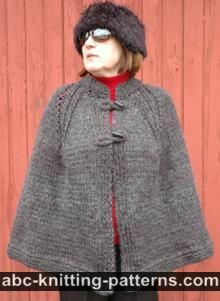 This is so beautiful - I MUST try, but I've never in my life seen anyone knit the way he does. What method IS this? I'm hoping that my regular way of knitting will accomplish the same thing.